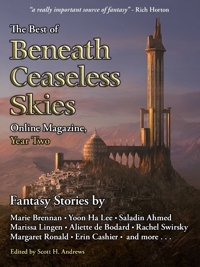 These and other awe-inspiring fantasy stories await in The Best of Beneath Ceaseless Skies Online Magazine, Year Two, a new ebook anthology of sixteen stories from Beneath Ceaseless Skies Online Magazine. 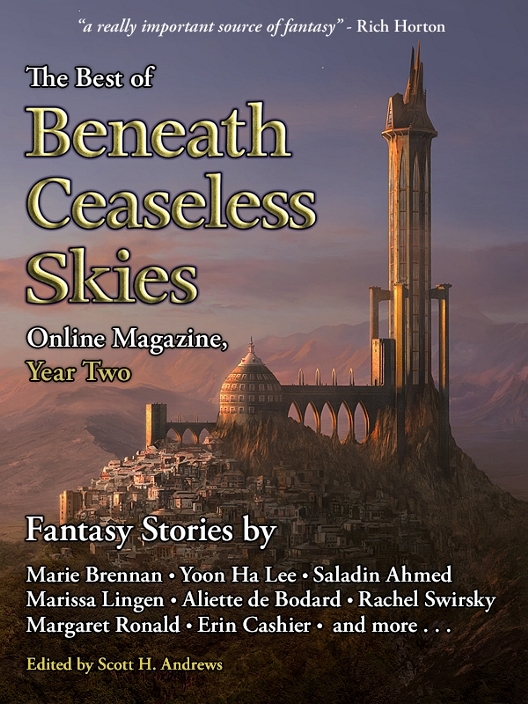 The Best of BCS, Year Two features such authors as Marie Brennan, Rachel Swirsky, 2009 Campbell Award finalist Aliette de Bodard, and 2010 Campbell finalist Saladin Ahmed. It includes “The Isthmus Variation” by Kris Millering, named to Locus‘s 2010 Recommended Reading List, and “The Pirate Captain’s Daughter” by Yoon Ha Lee, a finalist for the 2010 WSFA Small Press Award. NEW LOWER PRICE! The Best of Beneath Ceaseless Skies, Year Two is available for only $2.99 in five different ebook formats, including for Kindle, Sony Reader, Palm, Barnes & Noble Nook, and Stanza for iPhone/iPod Touch/iPad. Read it on your e-reader, smartphone, laptop, or tablet. All proceeds from the sale of The Best of BCS, Year Two go to pay BCS authors and artists for their work. Buy a copy to read great literary adventure fantasy and support Beneath Ceaseless Skies.